How does a park provide a safe and inclusive atmosphere for a balloon festival that draws more than 100,000 people over three days? With attendance at parks becoming focused on event-based models, balloon festivals can provide tourism and economic development for a struggling economy, provide a low-cost night out for a family of six, and provide a sense of pride within the host community. The Spiedie Fest and Balloon Rally in Binghamton, N.Y., dates to 1983 when a few families got together and argued over who had the best Spiedie recipe. Spiedies are small pieces of marinated meat (lamb, chicken, pork, or beef) that are skewered and then grilled. To put an end to their friendly rivalry, the families held the first Spiedie Fest Cooking Contests in 1983 and 1984. The balloons came along for the ride and eventually transformed the gathering into one of the top hot-air balloon rallies in the country. In fact, the event was recognized in 2001 by the Library of Congress with a Legacy Award, which honors cultural traditions, events, and individuals who capture the spirit of grassroots community life in America. Security is the utmost priority for this event. With continued shootings and terror attacks in the U.S. and all over the world, events must prepare for these issues in the same way. After terror attacks in France, where motorists mowed down people in a crowded public street, even items like strategic barricade placements have become an important feature. Around-the-clock security is imperative with more than 200 vendors and their inventory, as well as protecting tens of thousands of dollars’ worth of hot-air balloons. In order to safely manage a crowd of this size, festival design and flow is oftentimes a topic of conversation from year to year. To keep vendors and to satisfy sponsors, patrons must be able to engage with those manning the booths and be exposed to companies’ branding efforts. Spiedie Fest utilizes a “walk-through” design, where parking is at one end of the park and the “main attraction” is at the other end to force patrons to walk through the carnival. However, planners have to be careful not to compromise security with this layout, which can be difficult depending on the main attraction, which changes from year to year. The largest infrastructure need is water. In 2008, the park discovered a leak in the main water line. Due to the pipe running under an interstate road, the pipe was repaired by inserting a sleeve through the pipe, shrinking it from a 4-inch diameter to a 2-inch diameter. At peak times during a festival, toilets have difficulty flushing, while vendors who rely heavily on water (such as the seven-flavor Root Beer stand) experience low pressure, which is more like a trickle. To mitigate this risk, flushing toilets are replaced by porta-potties, and handwashing stations are rented for the duration of the festival. Additionally, free refills are not an option on beverages; however, a few water buffalos are brought in to serve vendors whose water needs are the greatest. There are also stricter requirements from security placed on vendors for water waste. Parking is another concern when talking about infrastructure. VIP parking is given to all executives, logistical personnel, sponsors, and vendors. The rest of the VIP tickets are sold to the public. For the remaining 90,000 people who enter the park that weekend, parking and a shuttle are offered at the State of New York Broome campus, which is 1.3 miles away. Volunteers may park and ride at Roosevelt Elementary school, about a half-mile away. There are three security checkpoints for entry—the main entrance (for those with VIP passes), the shuttle entry point, and the “walk-in” entry point. Two main issues arise with parking—overflow and weather. In 2017, security was forced to shut down the main gate for VIP parking for 15 minutes due to an overflow of vehicles. It was the only time this occurred, but alternatives should be considered to accommodate higher-than-usual attendance. Weather is another problem for the park where the festival is held. In this case, park managers have the flood plain of the park mapped to pinpoint the areas of greatest concern. Since the closest parking is on fields, these areas are closely monitored and evaluated to determine their drivable condition after a thunderstorm. Tire ruts are not only an inconvenience and maintenance issue for the park, but also a safety hazard for twisted ankles and mobility barriers. Towing and pulling non-county cars out of the muck also increases the liability risk to the park. Weather is also factor with programming for a balloon festival. Factors such as humidity, wind patterns, and precipitation forecasts all need to be considered when determining when balloons can take off and when they can inflate—or even try to. A park manager needs to know what questions to ask to balance risk and reward, as well as when to make a call when conditions are dicey. Morning and evening launches are usually the best times for balloons to take off. Night glows are especially fun and special for the festival. It’s exceptional when the balloons all have different designs and colors. 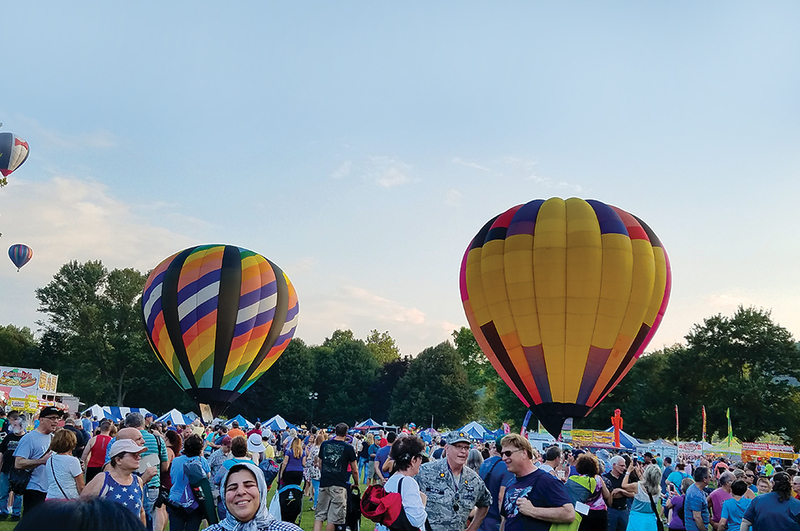 Balloon rallies like the Spiedie Fest can be managed on modest budgets if support is given from government administrations and department heads. In this case, government support can run upwards of $250,000, while festival needs may run $400,000, leaving a $150,000 gap to fill from other revenues like vendor spaces, sponsorships, VIP passes, and entry fees. Having varied programming surrounding the festival ensures there will be fun for the whole family. Based on a recent survey of 891 Broome County residents, market saturation for awareness of the festival was at 99 percent, so there is no shortage of potential participants, but there must be a broad scope of programming for everyone to be engaged and have a positive experience. Balloon Festivals like the Spiedie Fest and Balloon Rally can provide economic development, low-cost entertainment, and increased pride. While the rally requires quite a lot of work from the park, it is welcomed with open arms and smile. Matthew Francis Gawors is the former Director for Broome County Parks, Recreation, and Youth Services, as well as a Health Sciences Instructor at Binghamton University and a local business owner. Reach him at (607) 778-2193 or BCParks@Co.broome.ny.us.